This post is dedicated to the athlete/health conscience like me who is adamant about maximizing performance but strapped financially by the demands of this sport (race fees, equipment, coaching, nutrition, fueling, etc). All the technical information contained has been pulled from previous resources and is objective, not opinionated (I am not suggesting anything is right/wrong). Over the last year I have grown increasingly more intrigued about my nutrition and fueling protocol, having gained some perspective from other athletes and nutritionists since being evaluated by a sports dietician a couple years back. I went to a couple free seminars through clubs and was very interested by the speakers but was turned off by the excess amount of money required for an initial consultation. In addition I have some apprehension about what is considered ‘right’, more importantly how to figure out what’s right for me in a world full of Vegans, Paleos, Vegetarians, etc., I am willing to try something new but reluctant to invest until I know more about the program. This week I listened to my second presentation by Dr Philip Goglia, who has a rapport with the SoCal triathlon community. I really enjoyed what he had to say but looking at rates could not justify taking it to the next step with a consultation. Fortunately he was handing out free copies of his book and like he suggested in his speech much of the information is available in it and easy to interpret. I spent the next couple days reading the book, filling out charts and gathering data. I get blood work taken through a free service at work. I had my blood screened on site at the presentation but in addition have the results from my last analysis in May. I knew the numbers would be decent but was happy to see they were consistent as well, since I pretty much eat and exercise the same way year round. In Dr Goglia’s book there is a simple chart you can use, inputting the above information to determine your “Metabolic Type” which he breaks down into 1) Carbohydrate Efficient 2) Fat and Protein Efficient or 3) Dual Metabolism. There is also a secondary test utilizing a questionnaire and family history to determine which type you are however the blood work is considered more accurate. I generally separate Nutrition and Fueling into two separate categories, consider Nutrition what I eat outside of training and follow a strict fueling protocol for all exercise so that I don’t have to count calories for different volume. 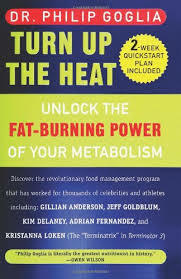 Steps #2 and #3 from Dr Phils book would then be to calculate Average Caloric Intake and Metabolic Rate to determine Metabolic Temperature for choosing which of 5 is your “Metabolic Scenerio” to get on a food program. Since I am not very concerned with gaining/losing weight, only getting the right stuff from here I put my emphasis on macronutrient breakdown. With QT2 I had a body composition analysis to determine ideal race weight and now I simply weigh myself once a week to ensure I am in the window, 165lbs being ideal, and trying to stay above that going into overload to hit race day right on point. 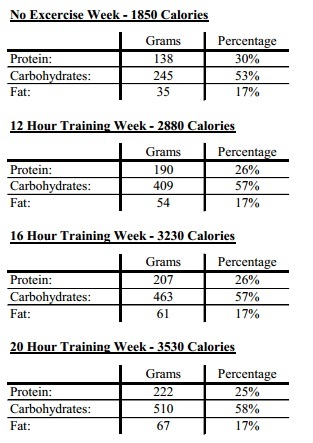 The following chart is my macronutrient breakdown for the protocol I have been toying with and modifying over the last few years. It’s not necessarily there yet but has made improvements each version (now on number 3). So it appears I am somewhat in-between. 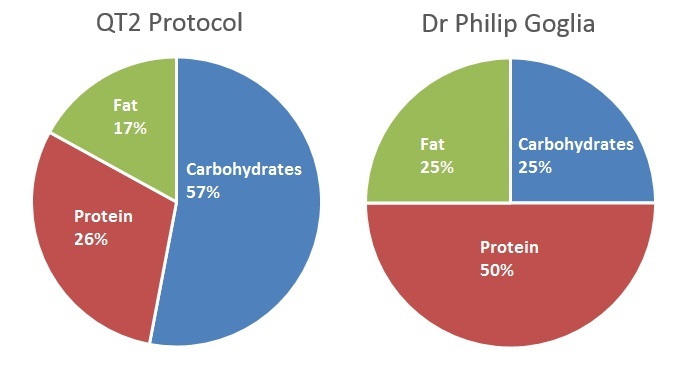 Protein intake is similar to QT2 protocol, way less than Dr Phils program, however I get more fat and slightly less carbs than prescribed. Keep in mind this is unfueled data and that I get about 1000 calories per day on average from gels and powders. 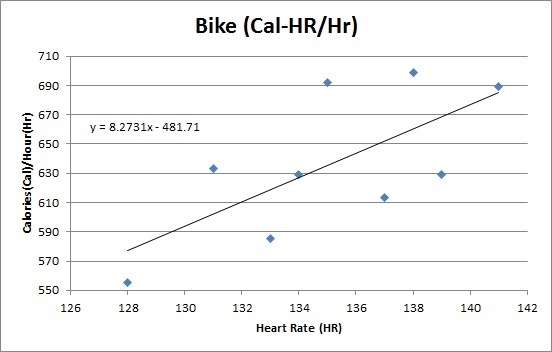 Unfortunately, unlike calculating calories in, it is difficult to determine exactly how many calories burned while swimming, biking and running nearly 20 hours/week. I researched calculators online that use age, distance and pace however neglect important factors such as perceived exertion (HR), weight, metabolism, temperature, etc. 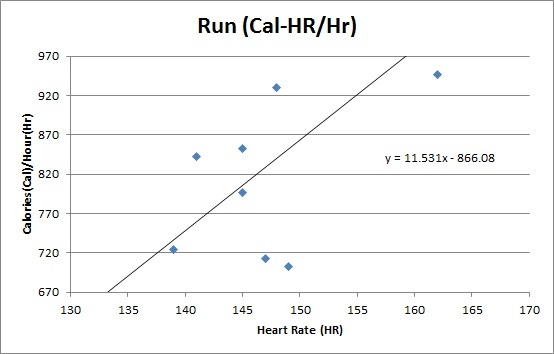 My ‘best guess’ was to utilize my Garmin calculation, graphing HR against Calories/HR for both running and cycling. I don’t know if this is an accurate measure, but it was the best I could think of. Nutrition protocols, like coaching, are very similar to ideologies. They are based on similar platforms but according to each philosophy every other is wrong. Get a blood screening done to evaluate cholesterol and other health indicators (often covered by insurance). 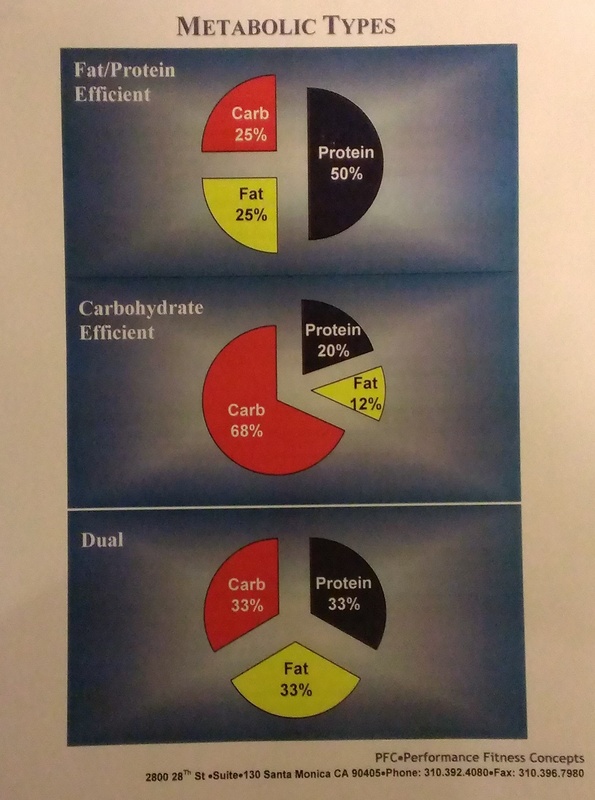 Count macronutrients (carbs, proteins, fats) to determine current distribution. Research different nutritional protocols to determine what might be right for you before investing. Drink a lot of water. The numbers of ounces may vary but the importance of hydration is unanimously significant. For athletes like me only, who do excessively high volume of exercise, forget about calorie counting and focus on macronutrient distribution. Simply look at weight as an indicator and do not put much emphasis on how many calories you burn on a long run or get from an avocado. The numbers are too variable and not so significant unless the goal is to lose or gain weight. Fuel well before/during and after exercising, HOWEVER I still have no idea what this means because I have heard so much conflicting information (train solely with carbs vs utilize fats, vs fasted exercise (crazy if you ask me)). Don’t just eat for utility, enjoy what/how you eat (I need to work on this one myself). Hopefully I can add to this list later. I hope this blog might be helpful for others but I also hope it will be helpful for me. Please send any thoughts, advice or criticism my way so that I can learn and grow on this subject. decided to come back to this – I did a lot more research on fasted workouts after this and what seems to be the actual conclusion of scientific studies is that doing 1-2 shorter workouts per wk fasted will improve your body’s efficiency at burning fat while you exercise, which is a goal for endurance athletes obviously, but it will NOT improve performance and thus should not be done for long workouts or hard intervals. So I am now doing this for 2-3 morning base mile/easy pace 1 hr workouts (1 in each sport). Curious to hear more about what you do now and more on that protein powder qt!